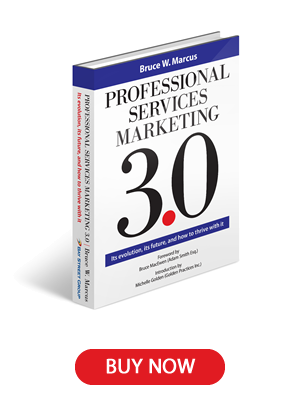 Outstanding examples of the new kind of law firms and accounting firms arising with Professional Services Marketing 3.0 are Shepherd Law Group, Valorem Law Group, Exemplar Law Partners, Seiler CPAs, and Axiom Legal. They have in common a drive to remake the law and accounting firm business models to better and more economically serve clients. Their focus is on putting the client, rather than the practice and the firm, at the core of their business model. Ronald Baker, founder of the consulting firm and think tank VeraSage, was a pioneer and early advocate of value pricing (which is most often at the core of the contemporary firm), including considerable original thinking on the definition of the concept of value to a client, for both law and accounting firms. He started his career as a junior accountant in the former Big Eight accounting firm, Peat, Marwick Mitchell (as did I, a decade or more earlier, and in a different capacity) , and has been a driving force in persuading firms to consider value pricing. Where it’s used most successfully, it’s based on his models, which are then further adapted firm by firm. The contemporary law firm is epitomized in the Boston-based Shepherd Law Group, both in concept and in practice. Specializing in employment law and litigation, it was started some 13 years ago by Jay Shepherd. About eight years ago, functioning on value-based principles delineated by Ron Baker, Shepherd abandoned the hourly billing format to develop a workable system of ascertaining the value of his service to his client and billing accordingly. Value pricing, says Shepherd, is more than just a replacement of the anachronistic hourly billing system – it’s a manifestation of understanding the meaning of value – but value to the client, before the considerations of the firm. The result is not only satisfied clients, but increased profit for the firm. At the same time, says Shepherd, value pricing impels the firm to avoid unnecessary processes – to be more efficient. The Shepherd Law Group is a small firm, but they are leading specialists in employment law and litigation. While it’s been said that a litigation practice is difficult to price by value rather than by billable hours, Shepherd has clearly demonstrated how it can be done, particularly where a firm’s expertise supplies the knowledge and experience. He is the firm’s owner, with no other partners, and functions with a small staff of specialists. This form of operating, he says, is a paradigm that breaks a mold, and that functions particularly well. Interestingly, Shepherd disdains the term “alternate billing”, particularly because it assumes that the other alternative is the billable hour The problem with the billable hour, he and others have pointed out, is that if there’s any value in hourly billing, it’s to the firm, not the client. To perform a service to clients with no value to clients is to be anti-competitive – particularly with today’s sophisticated clients. Shepherd’s use of value pricing is so effective that he has established a subsidiary operation, called PreFix, to both teach other firms how to do it and to consult to, and advise, law and accounting firms on specific pricing problems. His 14 points of how to determine a value price are widely known, and increasingly used by other firms, both in the United States and abroad. 1. I analyze the client. 2. I assess the importance of the situation. 3. I assess the urgency of the situation. 4. I pay attention to what my competitors charge. 5. I consider the relative values of each possible outcome. 6. I figure out how hard it would be for the client to get better service elsewhere. 7. I determine how important my firm’s expertise is to the likelihood of a successful outcome (in other words, is this going to be easier because of our particular skills, or could any monkey on the internet find the answers. 8. I consider what we charged other clients in the past for similar work. 9. I consider whether those charges were heavy or light in retrospect. 10. I consider the likelihood of getting more work from this client. 11. I assess how much work we’ve done for this client already. 12. I wonder how important getting this particular job is to our firm (if it isn’t, I might raise the price). 13. I decide whether to do a single price for the whole gig, or how to break up the job into mini-gigs with separate prices.